Geckos are among the superheroes of the animal world. These colourful lizards can scamper rapidly up walls, scuttle along ceilings and even hang upside down on polished glass. Yet the secret of their amazing climbing ability remained a mystery until relatively recently. The underside of a gecko's foot looks like a tyre tread and is covered in millions of microscopic hairs. Each hair splits into hundreds of tips just 200 billionths of a metre wide. The secret of this lizard's adhesion turns out to be the relatively weak intermolecular forces that draw materials together any time they get close. These van der Waals forces nevertheless explain how a gecko can support its own body weight on just one finger, and a single gecko hair can lift the weight of an ant. To un-stick, the gecko pulls its foot away at a different angle. "What we're talking about is something that is about as sticky as sticky tape - it's not crazy glue," says Prof Kellar Autumn, who became intrigued by gecko adhesion after being funded to develop climbing robots by the US military. Prof Autumn, from Lewis & Clark College in Oregon, added: "What is special about it is that it is controllable. And its controllability is based on geometry and physics, not chemistry." The effort to uncover the mechanisms behind gecko climbing has already yielded synthetic material that sticks in the same way. Stick, peel and re-stick a piece of existing adhesive tape several times and it quickly loses its clingy properties. Prof Autumn and Mark Cutkosky, from Stanford University, compared natural and polymer-based synthetic gecko hairs using a machine that simulated gecko climbing. This showed both versions could be re-used some 30,000 times without losing their stickiness. Synthetic adhesives could yield transformative applications in robotics, industry, medicine, sports and clothing. But one possible use always comes up in any popular discussion: could they allow humans to scale walls like Spider-Man? In 2007, physicist and engineer Nicola Pugno, from Turin Polytechnic in Italy, calculated that a person wearing gloves and boots made of carbon nanotubes and structured to mimic gecko feet could indeed cling safely to a wall or a ceiling. Challenges would include wear and tear and the propensity for dirt particles to collect and inhibit stickiness. The suit would have to work on every kind of surface and for long periods of time. 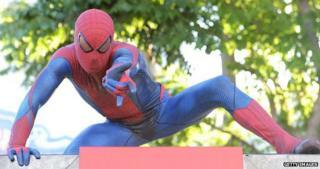 But Prof Pugno says: "We are not very far, in my opinion, from a kind of Spider-Man suit." Prof Metin Sitti, from Carnegie Mellon University, says the idea is "not impossible". Selecting a lightweight person and applying the adhesive to many parts of the suit (not just the feet and hands) would improve the chances of success, he explains. But, he comments: "We get questions like: 'Can you carry a one-tonne weight'. And we say: 'Maybe, but that's not our biggest advantage'." Several institutes have been developing robots that can climb walls - Stanford University's "Sticky-bot" can be seen in action here. Some scientists envisage "geckobots" being used to search for survivors in a burning building or disaster zone, to explore the rocky terrain of Mars, or even as toys. But many in the field are most excited by more routine applications. Medicine is one target area for these adhesives. They could spawn advanced bandages that can be removed easily after healing or gripping surfaces on instruments designed for delicate surgery. Since the mechanism works in the wet, it could be used to affix implants within the body. Stanislav Gorb, from the University of Kiel, studies biological adhesion; his work also looks at the way beetles stick to surfaces. He says gecko material has several advantages when compared with generic sticky tape. There is no "visco-elastic" adhesive to dry out, so it stays attached for longer and leaves no residue. But he says that with current production methods, they are unlikely to replace classical sticky tape. "Maybe in 5-10 years we will have a method that will make the tape very cheap - right now it isn't. Secondly, right now, the forces are in the range or even lower than traditional sticky tape." Metin Sitti thinks gecko material could provide alternatives to current "closure" technologies, such as hook and loop fastening, zips and sealing systems on food packaging. It is one area he is exploring through his company NanoGripTech, set up to commercialise his lab's gecko work. Synthetic adhesives work best on glass; rough or uneven surfaces pose more of an obstacle. Getting high performance out of gecko material on a variety of surfaces and in different conditions represents the firm's first challenge. "We have been focusing on what happens when the surface gets wet, oily, dirty and what happens when temperatures change from very cold to very hot," says Prof Sitti. "The second challenge is how can you manufacture and sell this [material] at high volume and at low cost?" Prof Sitti is working on this problem and expects within a year to begin manufacturing at low volumes. A silicone-based bio-inspired adhesive made by German firm Binder has been on the market for some six months. Prof Gorb was involved with its development. The company has been exploring medical applications and the "pick and place" technology used in clean rooms to precisely position components on to circuit boards. "Clean rooms often work with suction systems. That generates dust and requires a lot of energy, which contributes to the cost," says Jan Tuma, managing director of Binder. "We are only sticky on really flat, shiny surfaces. It depends on the pins per sq cm and at the moment we have 29,000 pins per sq centimetre. "Geckos have more, but they have had millions of years to develop, and we have had only a few." Prof Autumn says: "We can look to Nature as a giant library of design principles. The way gecko adhesives work is so bizarre and so different from the way that adhesives have been engineered, that I don't think we would have invented it."